When I was a kid in this new neighborhood, the houses were far apart and kids were scattered over a much larger area than on my previous little street. I had to travel to see any of my new friends. I had two available modes of transportation: my feet and my bicycle. We lived at the bottom of a steep hill and many of my friends lived up the same hill, sometimes far up the same hill. The road below us sloped down to the river where one of my best friends lived. In between me and another good friend were woods. I look back now and am amazed that we kids knew the trails throughout the neighborhood, allowing us excellent road-avoiding short cuts. One ran through the woods to my friend’s house, even though it meant I arrived in the middle of her rhododendron hedge. Another led down to the railroad tracks, across them, then along a cliff to the abandoned water works along the river. My feet were the best transportation on those outings. The long hill up from our property provided a tough choice. It was easier to walk up it, but it took a long time walking back. If I could push my bicycle up it(most of it was too steep even standing up on the pedals to pump), I could very quickly coast all the way home. This allowed me to stay longer at my friend’s house, so I usually took my bike. I usually walked to school, through the woods and across a highway to get there. Kids who lived closer, walked or biked. I knew no one whose mother took them to school, nor anyone whose mother chauffeured them anywhere. We were expected to get ourselves places. So we did. I had a scooter and would “scoot” around wherever I wanted to go. 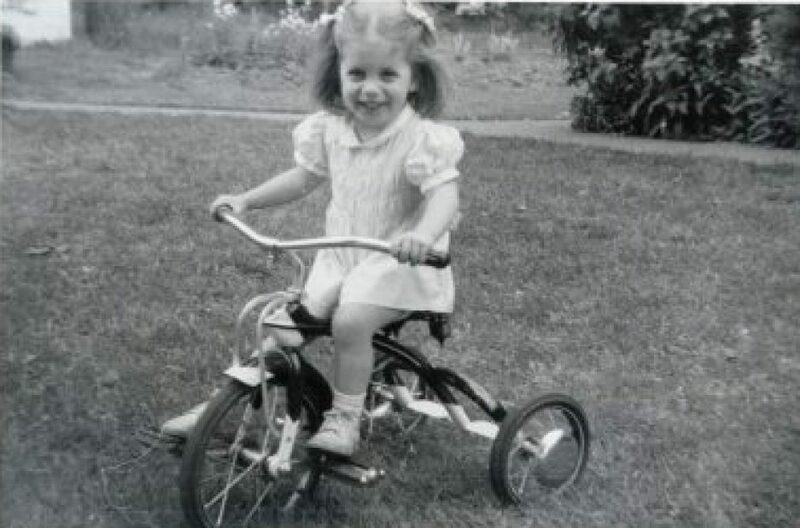 Oddly enough, my parents were fine with me walking or riding wherever within a mile or two, but it was my grandmother who was nervous and didn’t want me to go. That’s interesting.I wonder what made her worry. I think she just worried about everything (she probably had an anxiety disorder to be honest), but I found it odd since her generation was so chill about kids roaming around unsupervised. In hindsight it is easier to understand our puzzling relatives now that we know more about psychology. Same in my family. We appreciated things a lot more then than kids now. I walked to and from school in all weather, easily a mile each way. Well we sure were strong in the legs! I’m not a fan of walking in the wood. I like your last few lines. I knew know kids that were chauffeured. I see a lot of kids today with limo service everywhere. It is sad how far apart kids live and we perceive it isn’t safe for them to walk.